I got all these valuable items from the first Christmas party for bloggers I attended at the Legend Villas in Mandaluyong City last Saturday. Yours truly with Ms. Joy handing out some prizes. Massage Package for 3 moms courtesy of Mommy Leirs. Soyami Soya Chips was given to the kids instead of giving it as raffle prizes. The first ten moms who arrived got a Body Shop lotion each, while Tetcha gave some token for the first ten moms too! 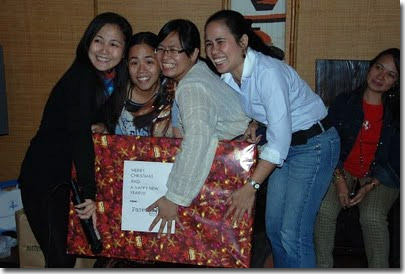 Mommy Beds took home the grand raffle prize from Tintin Bersonal- Babao and Parentin.tv, the First Philippine Online Parenting Show. 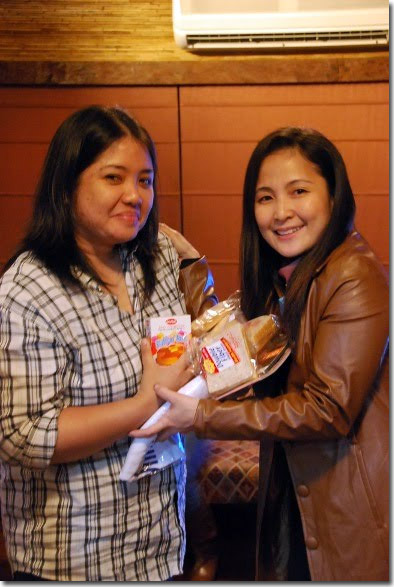 Miss Agnes of Ainon drew the grand prize winner while Miss Sheryll of Proud Mama dropped by for their products. Beyond the partying and merry-making, the small group of mommies intends to raise some items including old (and new) clothes for mommies and babies, toys, books and other tangible items that can be of help to an organization that caters to abandoned and abused women and their children. We hope to add more items for the institution. This entry was posted in For a good cause, Holidays, Occasion and tagged Christmas party, Give Love on Christmas Day, Legend Villas, raising fund for a good cause on December 13, 2010 by Yami.